Here’s what happened in last night’s session of Hoard of the Dragon Queen as the adventurers headed north to the Carnath Roadhouse and into the notorious Mere of Dead Men. Each PC gets 620 xp. The High Road Charter Company convoy leads Waterdeep under the command of Ardred Briferhew. The PCs and Jamna Gleamsilver make up half the armed escorts guarding the supply wagons. The convoy stops for the night at Thornhold. The PCs consider sneaking into the keep to spy on the secretive Stoneshaft dwarves but think better of it. With the road now running alongside the Mere of Dead Men, the wagons come under attack from lizardfolk. Rosie kills two with her eldritch blast, Turin sends one to sleep, and Gwastdyn’s conjured lions take down a fourth, allowing the PCs to gang up on the much bigger blackscale and finish him off. The adventurers notice that the lizardfolk had glass beads, costume jewellery, coins and other trinkets mixed in among their bone and feather fetishes. Some were also armed with steel weapons. After ten days of travelling the convoy arrives at its destination – the old Carnath Roadhouse which is now being used as a supply depot and work camp for the road builders. Bog Luck, the compound’s half-orc supervisor, points them in the direction of their quarters as the wagons are unloaded, turning down Ug’s request for a single room. The PCs notice he is wearing a scabbard decorated with dragon designs, similar to those worn by the Cult of the Dragon fighters at Greenest. Later that evening in the common room, Ug and Turin talk to Bog Luck again. Ug asks the half-orc where he can find Naerytar and the black dragon that killed his family. Turin is more subtle (not hard!) and tells Bog Luck he’d like to hear the story behind his interesting-looking scabbard. The superintendent first tells them he killed a paladin for it, then says he's only joking – he bought it in Waterdeep. Meanwhile, Rosie chats to Gristle Pete the cook after overhearing him complaining about noisy rats keeping him awake at night. She finds out these “rats” only make an appearance shortly after a new shipment has arrived at the camp and crash around in the warehouse below the kitchen. Crake and Gwastdyn speak to some of the labourers about the Mere of Dead Men. Most avoid going into the swamp, particularly after one of their number wandered into the mere following some glowing lights and never returned. Lizardfolk and bullywugs sometimes attack the roadbuilding crews, hence the need for armed guards. Just as the PCs get ready to leave one of the cultists confronts Rosie, accusing the warlock of murdering her friend Penrin and demanding satisfaction. Rosie agrees to a fight in the courtyard and a small crowd of labourers and cultists gathers to watch. The ex-pirate acts first, striking the cultist twice with her eldritch blast, then using misty step to escape to the balcony when her opponent closes to melee. The cultist chases her up the stairs but is brought down by Rosie’s blasts before she can get into close combat again. With the show over, the crowd disperses. Rosie has a short rest to recover from her wounds, while Ug keeps watch on the cultists’ room. Nothing happens so the paladin goes over to the warehouse and has a look inside. He’s joined by Turin who persuades him that perhaps it would be a good idea to fetch some of the more stealthy members of the party. After listening and sneaking around outside with Rosie and an invisible Turin, Crake picks the lock on the door inside the warehouse. Inside are six lizardfolk who have come up through a trapdoor. The thief is hit a couple of times and disengages from melee, allowing Ug to take his place in the doorway. 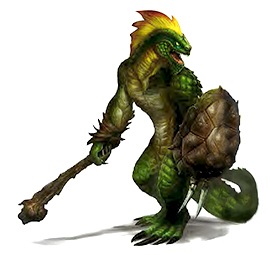 Turin casts shatter, catching all the lizardfolk in its area, and making it fairly easy for the PCs to finish them off. Realizing that some of the crates are marked, Crake opens a couple of them and confirms they hold cult loot. Rosie pockets a handful of items while the others discuss what to do next. Leaving a note for Jamna, the PCs grab their gear and head down through the trapdoor into a dank tunnel. After 500 yards, the passage comes out in the Mere of Dead Men – a marked trail leads further into the swamp. The party slog through the bog for a couple of hours before reaching an area where the vegetation is dying and diseased. Here, they are attacked by a catoblepas. The fell beast turns its deadly gaze on Ug but fortunately the paladin is made of sterner stuff and survives. 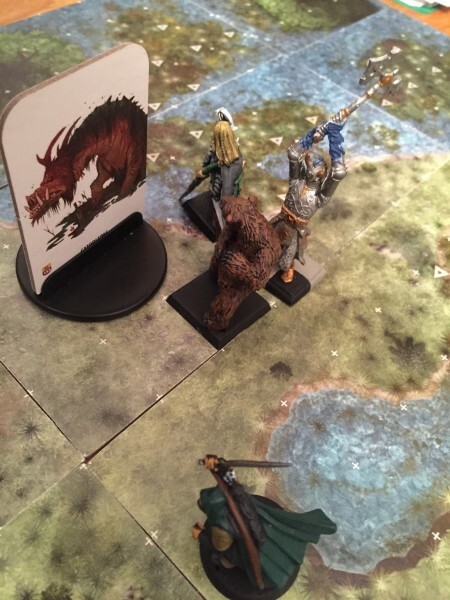 As the monster closes to melee, Gwastdyn wild shapes into bear form and the PCs manage to slay the creature before it can use its gaze again. By now it is the early hours of the morning and the adventurers need to sleep. They find a patch of dry land in the marsh and rest.